Responsive design means that the internet page changes its shape and size to suit virtually any display screen, from the smallest phones to the largest Laptop monitors. For any gadget, webpage elements get bigger or scale down to look perfect. Responsive website design allows you to strengthen buyer experience and give a 100 % access to the internet site information from any device. The online chat will let you engage with your customers instantly. Let users ask for support team's advice or contact sales department while struggling to make a choice on the product. Your genuine help can turn visitors into loyal customers. Sample Data Installer is an element that inserts a number of documents storing live demo content. If you wish to make your web page look just as on live demo, this module will help you. Additionally, adding sample data content can save your time substantially whilst making a site. The Search Engine Friendly website helps any searcher to crawl every web page of the web page, determine the content and index them in the repository. You don't need to be a professional at SEO to get high positions in Google. WordPress SEO plugins allow to compose SEO-friendly title tags and meta descriptions, and also analyze on-page content, let you create XML-sitemaps, and many more. Bootstrap is a handy tool and that is the explanation it's extremely popular. Utilizing this type of framework, it is possible to create responsive design, appropriate to any kind of display size, prototype brand-new layouts without difficulties and ensure your internet site is actually cross-browser compatible. How many applications, programs etc can I use to integrate with the PrestaShop ecommerce templates for Pet Boutique under one extended license? The extended license gives you the right to use the purchased PrestaShop ecommerce templates for Pet Boutique for the integration with one software/freeware/application/CMS/sitebuilder only. In case you would like to use the template with the other application, the other license is to be acquired. What will I see instead of the images after installation of the PrestaShop template for Online Pet Shop? After PrestaShop template for Online Pet Shop installation you will see blurred images included for demo purposes only. Can I put low resolution thumbnails of PrestaShop ecommerce templates for Pet Accessories Store on my website for my clients to choose designs? Can I resell Pet Shop PrestaShop ecommerce themes I bought the developers license for? You cannot resell the customized Online Pet Store PrestaShop ecommerce theme as a template, but you may sell it as a project to your client. Can I get the PrestaShop design theme for Pet Store in higher resolution to use for printing? No, we design PrestaShop designs for Online Pet Store optimized for web resolution only. In what cases I don't need the extended license for PrestaShop ecommerce themes for Animal Shop? Make sure that these charges for PrestaShop design for Online Pet Store have different order IDs. If it is so, contact our billing department. Are there any discounts if I'm buying over 10, 20, 30 or more PrestaShop design for Online Pet Store? Please email to marketing@templatemonster.com with your inquiries about PrestaShop ecommerce themes for Animal Shop. I have customized the Pets Supplies PrestaShop theme and would like to protect my content by copyright, can I place Copyright, Mycompanyname.com? After Pets Supplies PrestaShop theme purchase you can put your copyright to the template. But you cannot place a line at the bottom (or any other spot) of the customized project saying "Website design by Company name". Nevertheless, you can place "Customized by Company name". Can I resell the customized PrestaShop design for Online Pet Store? No, you cannot resell the customized PrestaShop design for Online Pet Store as a template but you may sell it as a project to your client (see paragraph 1 ONE TIME USAGE LICENSE for more details). Are there any limitations on selling the PrestaShop ecommerce template for Pet Food Store as the integral part of my new product? Will TemplateMonster help me to install my Pet Store PrestaShop design theme? Some of our products like osCommerce templates, Zen Cart templates, etc. require installation to operate. Installation services are not included in the package price. TemplateMonster though offers you a variety of sources to help you with installation of your Pet Store PrestaShop design theme including installation instructions, some articles with our Online Help Center. Our Knowledgebase contains customers questions and most frequent problems. Anyway, you can always refer to our partners from TemplateTuning.com to install your Pet Store PrestaShop design theme for you for a small fee. I like the image from the PrestaShop design for Online Pet Store and would like to use it for my advertising campaign, can you send me this image in a higher resolution? No, we can't provide image in higher size or resolution rather than it is on the PrestaShop design for Online Pet Store. We recommend looking for professional images on online photo resources. What is the price for acquiring the extended license for PrestaShop ecommerce template for Pet Shop ? There is no set price for acquiring the extended license. The price is based on the PrestaShop ecommerce template for Pet Shop 's unique price for those templates you would like to use for the integration. The price for purchasing license for a single template is half of the template unique price. 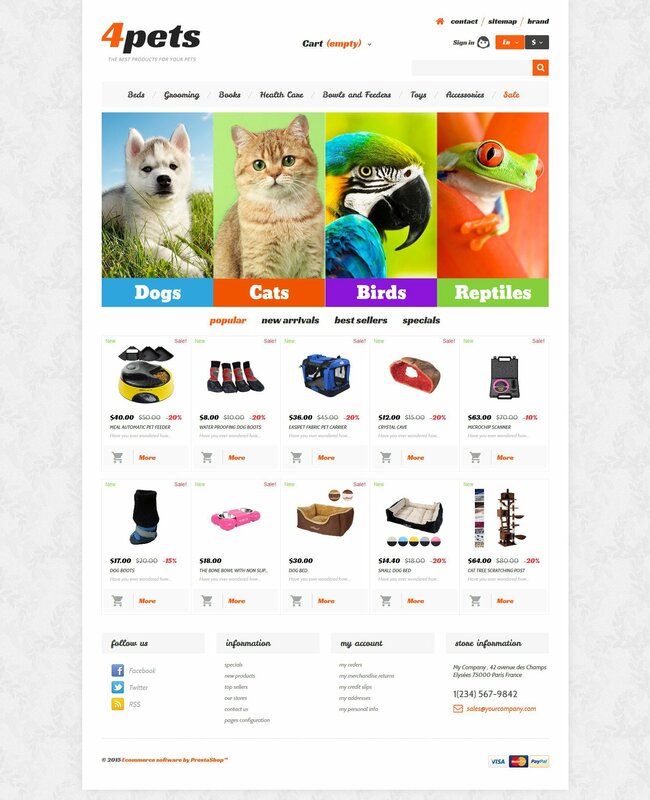 I would like to purchase Pet Store PrestaShop design theme, but it is not available on the site anymore. The Pet Store PrestaShop design theme has been sold out for exclusive price or discontinued.As technology inevitably develops, TemplateMonster may discontinue the production of certain products. It can be no longer available for sale because of being outdated. Can I customize the PrestaShop design for Online Pet Store? Yes, you can customize the PrestaShop design for Online Pet Store to any extent needed. You cannot use a header of the template for one project though, and images from the template for the other project. Is it possible to use your Online Pet Store PrestaShop designs to develop websites for my customers? Yes. It is perfect for designers who want to offer their customers a high-quality design and also save time and money. Keep in mind that when you purchase the PrestaShop template for Online Pet Shop with ordinary or exclusive license you're entitled to create only one project (one domain name). Can I use graphics from PrestaShop design theme for Pet Shop Supplier I purchased for use in printing? Yes, it's not prohibited to use the PrestaShop design theme for Pet Shop Supplier graphics for printed material, but the resolution of the templates graphics ( except for logo templates) is not enough for printing. Can I customize the PrestaShop template for Online Pet Shop if that's required by application settings? Yes, you can customize the PrestaShop template for Online Pet Shop code, graphics, fonts to any extent needed. Can I resell the PrestaShop template for Online Pet Shop as is? No, you cannot resell the PrestaShop template for Online Pet Shop as is. Can I get the extended license for some other pricing than the half of the initial PrestaShop design for Online Pet Store price? No. The price for purchasing license for a single PrestaShop design for Online Pet Store is the half of the template unique price. Will the Pet Shop PrestaShop theme be deleted from TemplateMonster database? No, the Pet Shop PrestaShop theme will not be deleted from TemplateMonster database. What do I receive when I order a PrestaShop design for Pet Clothing Shop from TemplateMonster.com? After you complete the payment via our secure form you will receive the instructions for downloading the PrestaShop design for Pet Clothing Shop. The source files in the download package can vary based on the type of the product you have purchased.If you need unzipping software to open the .zip archive, Windows users may visit www.WinZip.com, Mac users may visit www.StuffIt.com.